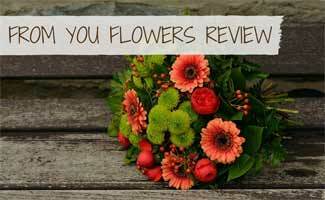 Home > Living > From You Flowers Review: Could You Save Big On Your Flowers? Want to have flowers sent to your loved one without spending an arm and a leg? From You Flowers lets you order flowers online and for a reasonable price. Prices for the same flower arrangement can vary based on location, time of year and quality of flowers, but From You Flowers offers beautiful floral designs at a price that’s hard to beat. Learn more about why we think From You Flowers is among the best. Looking for Organic Flowers Online? Get 10% off sitewide at From You Flowers via this link. We also have a dedicated From You Flowers coupon page where our readers can find and discuss other offers. What Do Customers Think Of From You Flowers? From You Flowers gives you options to save money, including ordering flowers without a vase. If you go this route, here are some of their tips on how to arrange beautiful flower bouquets. From You Flowers is a great fit if you’re on a budget, but if you want to go organic, you’ll have to look elsewhere. Check out our reviews of the best places to order flowers online, which includes several eco-friendly flower services. Have you ever purchased flowers online? What was your experience? I ordered flowers as a birthday surprise and am extremely disappointed and embarrassed at what was received vs. what I thought I was ordering. The flowers that were delivered look NOTHING like what I ordered – two roses and three lilies for $53.34 (this was supposedly including an 8% discount)! They are cheap and ugly looking. I called customer service and the lack of care was appalling. They offered to refund 25% and redeliver flowers. The refund I received wasn’t even the promised 25%! Very disappointed. Would not recommend them. I purchased an arrangement for my mother and paid an extra $4.99 to have them delivered before noon. The flowers didn’t arrive until after 3pm. By that time my mother was not home to receive them. Their customer service kept me on the phone on hold for over 25 minutes. To top it off the Flowers did not look anything like their online images. The roses were only buds and were about the size of a quarter. They had cheap wild flowers mixed in. Very small arrangement NOT WORTH the money. I would give them a zero star if I could!! DO NOT ORDER FROM THIS COMPANY!!!!! I ordered from this website because it said same day delivery. Not only did it not arrive on the day of order, when I spoke with customer services I was told each time I called that it would be there within a set time, finally arrived and the product had cheap replacements for what was in the photo. I understand they do not guarantee it will match the photo, but come on, at least have the company you contract with have quality products, not Dollar Store looking crap. Customer service was terrible. Will never order from here and will never recommend this crap fest of a company. I wish I had read the reviews first. STAY AWAY FROM THIS COMPANY!!!!!!!! Wow, great tips to save money on flowers. Do NOT waste your time and money!!! They refuse to give a full refund when you call to cancel after the wrong persons flowers are delivered, only having the “original” bouquet try to be traded after 8 hours in a delivery uber car!!! Was to have been an upgraded “Premium ” bouquet that I paid for! Sad, both looked like grocery store bouquets!!! Only would give 50 percent refund and replace flowers the next day! Um, no longer their birthday and had to deal with incorrect delivery, sad flowers and premium assorted chocolates bot delivered! Had to ask again for refund!!! This company is a nightmare!!! STAY AWAY!!! Has anyone used these for ordering flowers before? Seems like a great deal but just curious to know if the quality is good or if you pay for what you get?